Have a look in the shop. A familiar site in a certain district in the East End of London? The drawing is on antique ledger paper dated 1951. 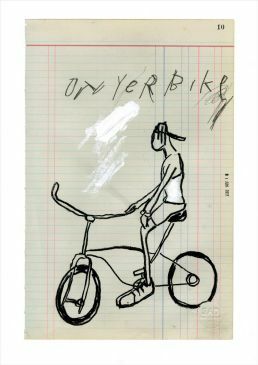 On Yer Bike is a drawing study of a lad on his bike doing his thing around London. A print for the biker about town. 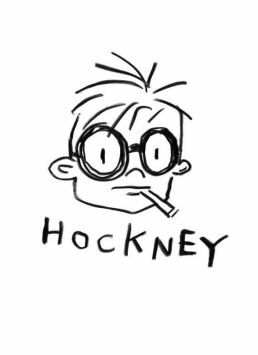 The line captures the youthful distinghuised Hockney puffing on a cigarette. Brighter eyed and inquisitive. A British visual graphic artist from East London. I have exhibited extensively in London, New York and Europe. I have work in private collections in London, Paris, Italy, New York and Japan. 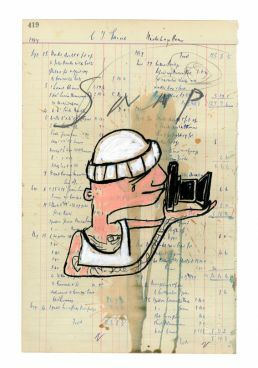 My work is best known for its distinctive drawing graphic style and works that are made from found objects and wood. Reoccurring themes and thoughts pervade my story telling capturing child-like views of the world and observations of daily life, masculinity, race, class and social history. Whilst drawing is at the center of my practice I work across an exclusive range of media including sculpture, painting and assemblage. "An artist is not paid for his labour but for his vision"